For a preview, which will appear above, click on a thumbnail image below. For a full-sized version in a new window, click on "Full Size". 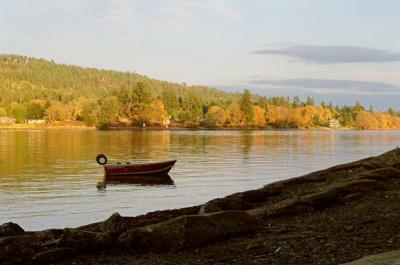 A rare opportunity to own an idyllic half acre of sheltered south facing low-bank waterfront on pristine Mudge Island. Watch passing whales from the expansive windows of this immaculately maintained 1,455 sq.ft. three bedroom rancher offering exceptional front row ocean views. Gracefully overlooking a private beach, the open floor plan and vaulted cedar ceilings of this West Coast design are timeless in their appeal. The extensive low maintenance landscaping of the beautiful park like grounds includes stone walkways, an elegant fire area, charming archways and a delightful arboured patio. An attractive 800 sq.ft. outbuilding features 9' ceilings with skylights, a large heated workshop, a lovely guest studio with cedar ceilings, and attached carport. This home is offered furnished, and includes a small motorboat. Referred to as 'Magical Mudge' by the locals, this unique island is valued for its stunning natural beauty, amazing array of wildlife, fresh salt air, and quiet slow pace of life.Located moments from Gabriola�s car park/boat launch, and 20 minutes from Naniamo area marinas. This special property must be experienced to be truly appreciated.